Acamel is a horse that's been designed by committee - or so the saying goes. Unlike horses, they're rather odd-looking creatures with lots of lumps and protuberances. They also have a grumpy and sometimes difficult demeanour. Why are we telling you this? 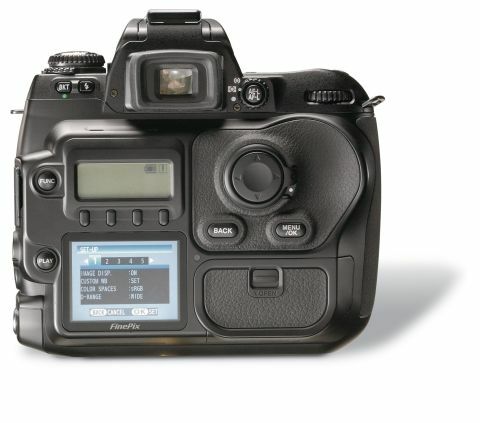 Well, if the Fujifilm FinePix S3 Pro SLR were an animal... then it would almost definitely be a camel. Incidentally, that's not a criticism. Some of my best friends are camels and although they aren't necessarily built for speed they are heavyweight plodders that can always stay the course. The FinePix S3 is definitely a camera that will stay the course. If you're looking for a digital camera for sports or action photography look elsewhere, but if it's portraits or weddings you're into, then this could be the one. It's a heavy beast and has all manner of odd lumps and bumps upon it. The controls don't naturally fall to hand and the overall balance is slightly unwieldy, but its 6-megapixel Super CCD does take some smooth and silky images. The S3 is powered by four AA batteries instead of longerlasting lithium-ion cells. This means it is somewhat less enduring, but you can buy lots of cheap replacement batteries and even use a pack of Duracells if you get caught short. Lenses used by the S3 Pro are Nikon F mount, and Fuji recommends the Sigma 18- 50mm f2.8 zoom lens. It's a sturdy little lens that offers a good range and exceptional image quality, although its motor is a little noisy when focusing and the £370 price tag is rather excessive. Taking it apart Fujifilm has also used a Nikon film camera as the shell of the S3, and kitted it out with its own sensor, electronics and an odd slot that takes both CompactFlash and Fuji's own xDPicture cards. Next to the card slot is a colour LCD screen for viewing images and above that, a rather odd and clunky mono LCD status panel. It's all a bit confusing and coupled with a diaspora of buttons and knobs; the S3 can be a bit of a trial to use to begin with. Assuming you can get the hang of using the S3, then this really is a camera that deserves a closer look. The Super CCD is an advanced type featuring both R and S sensors. One type takes care of the main image while the other is detuned in order to capture more detail in the highlights. The resulting 4,256x2,848 image records 12.34 million pixels and records a wide dynamic range. This is definitely a camera for weddings, where preserving detail in a bride's white dress is paramount.